For the third time in less than a week, Trump has sounded the alarm about the "huge caravan" of Latin American immigrants traveling through Mexico unobstructed by local authorities, and seeking asylum at the US border. Previously, Trump used the caravan as an example of why his border wall needs to be built and also as an excuse to attack Democrats for their part in watering down border-security measures included in the $1.3 trillion omnibus spending bill. He's also attacked the Mexican government for ignoring the situation, ominously threatening to remember their negligence as NAFTA negotiations continue. Today, he took his threats one step further by not only threatening to kill NAFTA - Mexico's "cash cow" - but also to cut off foreign aid to "Honduras and the countries that allow this to happen" before closing with: "Congress must act now!" The migrants, mostly Guatemalans and Hondurans, are hoping to escape brutality and violence that proliferates in both countries: "The crime rate is horrible, you can't live there," a migrant named "Karen" told BuzzFeed News on the side of a highway near the Southern Mexico town of Huixtla. "After the president [was sworn in] it got worse. There were deaths, mobs, robbed homes, adults and kids were beaten up." 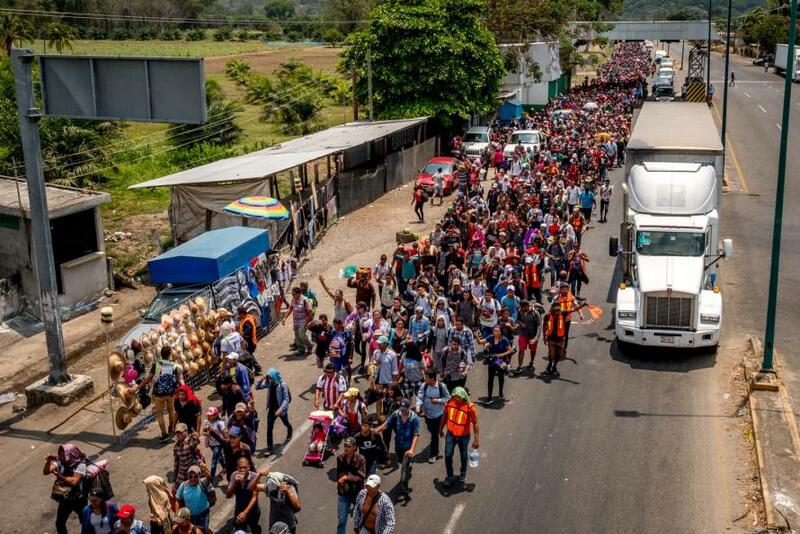 As the migrants move closer to the US-Mexico border, the Washington Examiner reported that a third Mexican town welcomed the caravan, which is about 400 miles into its journey, and fast approaching the southern US border. Meanwhile, every day the caravan marches in a northern direction, is a day in which Trump will tweet about it.